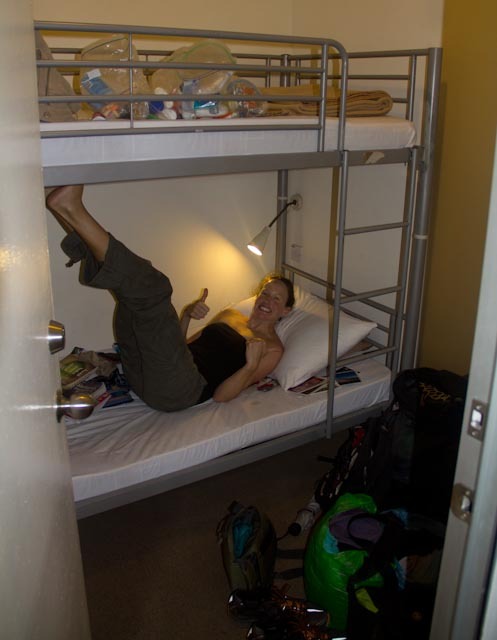 Would you pay $20 to sleep in a 7' x 7' room with bunk beds and no bathroom/window/AC/TV in the middle of bustling Kuala Lumpur? You shouldn't. And normally, we wouldn't either. But 'one of us' made a slight error this morning booking the bus to Singapore, which is five hours south of here. Instead of getting tickets for today, as planned/discussed/agreed/argued over, Kip somehow purchased two nonrefundable and unchangeable seats for tomorrow. After we had checked out of our hotel. And of course, it's Friday, and it just happens to be a national holiday in Malaysia. Do things like this ever happen to you? They happen to us. A lot. Like the time we went to Costa Rica. Kip got a sweet deal online for a rental car in San Jose, which is the country's capital. Turns out, San Jose is also a large city in California where the car company also does business. It's also where some benevolent rental agent is probably still holding an economy sized car reservation for us in case we ever go there. Once the rental car was sorted out, we stopped to get gas and use the ATM. We got some snacks for the road, and went to pay. The cashier just said "more" as Kip held out a pile of cash he'd just taken out of the ATM. 1200 Colones sure sounded like a lot. Turns out, it's only about $2. As Kip walked back to the cash machine, he vowed to check the exchange rates from then on. But wait, don't go thinking Liz is the perfect travel partner. On the same Costa Rica trip, two days before we were set to fly back home, we were relaxing on a stunning Pacific beach a full day's drive from the airport in San Jose. Liz says something like, "Honey, I really wish we didn't have to go home tomorrow." Kip, all-knowing that he is, said, "Slim, my dear, luckily we don't have to go so soon, since our flights are for the day AFTER tomorrow." High drama ensues. Liz finds her ticket. Kip finds his. We had booked our tickets separately but while on the phone together with two different agents (long story). Somehow, Liz booked her flight a day earlier than she was supposed to...so, Kip got to drive back a day early and spend the night in San Jose. Which is in Costa Rica, by the way.